The event kicked off with a discussion between three industry leaders on the role of responsible technology in society. For Rashida Richardson, Director of Policy Research for AI Now Institute (a research centre dedicated to examining the social implications of artificial intelligence), existing flawed technology (for example biased machine-learning algorithms) should force uncomfortable conversations about inherent biases in society and new technologies should be designed to consider the structural forces of society whether they may be political, economic, or cultural. 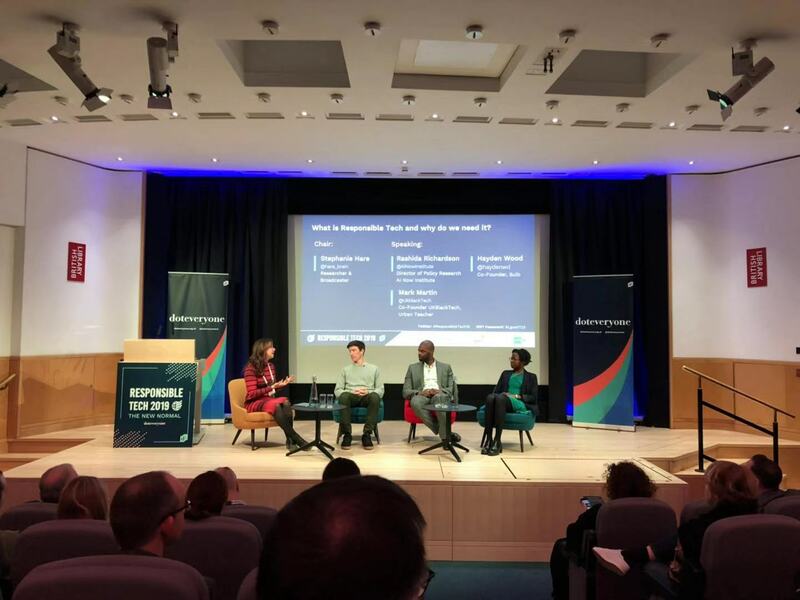 For Mark Martin, co-founder of UK Black Tech, the flawed nature of current technological products and services is a result of the lack of diversity within the tech sector — there are no British born BAMEs at senior board roles in tech companies. Technology also has a role in sustainability according to Hayden Wood, CEO of Bulb, a green energy company. Not only can it help reduce CO2 emissions, but it can also lower consumer costs given that 25% of traditional energy bills consist of administration costs. Additionally, Wood noted the company’s efforts of maintaining transparency in their marketing and advertising processes to ensure informed-decision making, as well as encouraging feedback from customers. This panel brought to light the obstacles the tech sector will need to overcome to establish new standards. Still, participants agreed that trade-offs between stakeholders as well as transparency in product development will facilitate the transition to the “new normal”. Up next, Jeremy Wright MP, Secretary of State for Digital, Culture, Media, and Sport presented his vision “tech for good”, centred on four key verticals. Firstly, establishing safety, privacy, and responsibility at the core of technology development. In light of the passing of Molly Russell, he stressed the importance of embedding protection features into digital platforms. Already, the Code of Practice for Consumer IoT Security will help ensure that Internet-connected products are built to protect consumer privacy and safety. Secondly, incentivising social tech companies, such as start-ups Goodgym and Activage which have developed solutions to tackle loneliness and bring communities together through smart living. Thirdly, promoting innovation-friendly regulation. For example the UK government is exploring new mechanisms for data sharing, in particular data trusts, recommended by the AI Review in the Industrial Strategy AI Sector Deal. Finally, creating a strong foundation of digital skills to produce a digitally skilled workforce across sectors. Further panels focused on putting responsible tech into practice by creating economic models that encourage businesses to innovate with ethics in mind. This includes incentivising public participation in decision-making. For example, 70% of the smart city policy agenda of Barcelona is shaped by its citizens — from street lights, parking and waste disposal to transit systems and procurement guides. For Francesca Bria, Chief Technology and Digital Innovation Officer of Barcelona, it is critical to establish a social pact for data with human rights at its core and this starts with the right laws and regulations.